Cafe sua da (Vietnamese iced coffee with milk) - if there's a better way to wake up in Southeast Asia, we don't know it. We love Malaysian coffee. Thai coffee, sock-filtered the old-fashioned way (if you can find it), can be lip-smacking as well. Sumatran and Balinese brews give a certain endearing jagged-edged kick (just avoid the loose grounds at the bottom of the glass). A mug of Philippine barako is worth a bit of contemplation. But there is just nothing like a glass of iced coffee Vietnamese-style. So thick, so smooth, so caffeine-laden, yet so refreshing. We gave up long ago trying to figure out what the secret is. We tried brewing our own at home when we lived in Saigon, using the fiddly local drip-drippy stainless steel filters, then employing paper filters, and then the muslin sock technique. We used highest-grade Trung Nguyen coffee as well as beans proffered by various sellers about town, grinding it coarse and grinding it fine. We bought packets of pre-ground beans adulterated with additives. We stirred in sweetened condensed milk, then tried condensed milk and sugar. In the end our home brew never tasted even an eighth as good as the stuff whipped up by the gals at the coffee shack down the street. Rumours abound concerning what goes into the stuff. We don't want to know. We don't care. We just want to enjoy our cafe sua da in ignorant bliss. 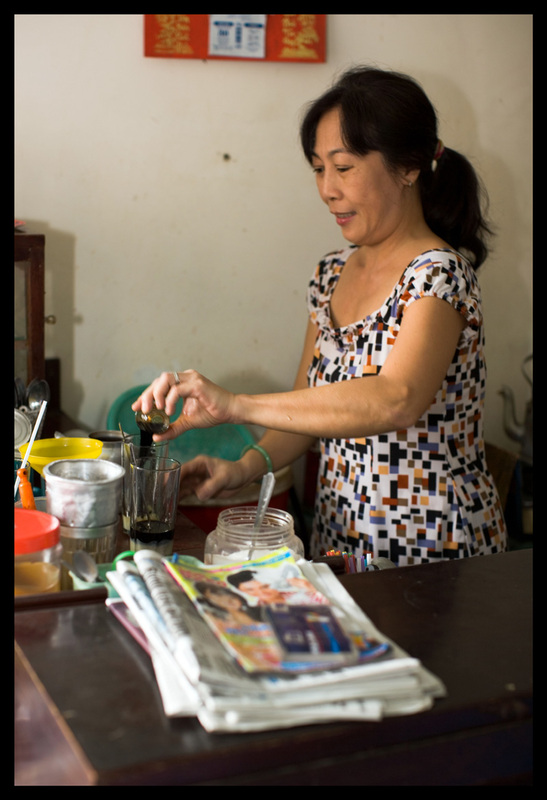 This proprietor of a neat little coffee room (calling it a 'shop' would be stretching it) on a narrow street in the vicinity of Tan Dinh market whips up her version the standard way, adding a shot or two of pre-brewed pitch black joe to a glass already annointed with sweetened condensed milk, piling in the crushed ice, then adding more coffee before finally giving it a stir. As always, coffee is accompanied by weak tea to 'refresh' the palate and wash away the sweetness of the milk. We found something a bit different at Ba Hoa market, where this caffeine mistress presides over a short length of a tiled coffee 'bar' (the term is used loosely) with impossibly narrow, low-to-the-ground wooden bench seating. She starts by stirring the standard sweetened condensed milk-coffee base, but doesn't blend the two compenents completely, leaving a thin layer of untouched milk at the bottom of the glass. Then comes ice and more coffee. We don't know if her no-final-stir method is aesthetically motivated or if it affects the taste. We do know that this glass of cafe sua da, with it's lovely Jello 1-2-3 effect, is the best we drank in three caffeine-addled days. We stayed for another glass, and another. And then returned the next morning for three more. 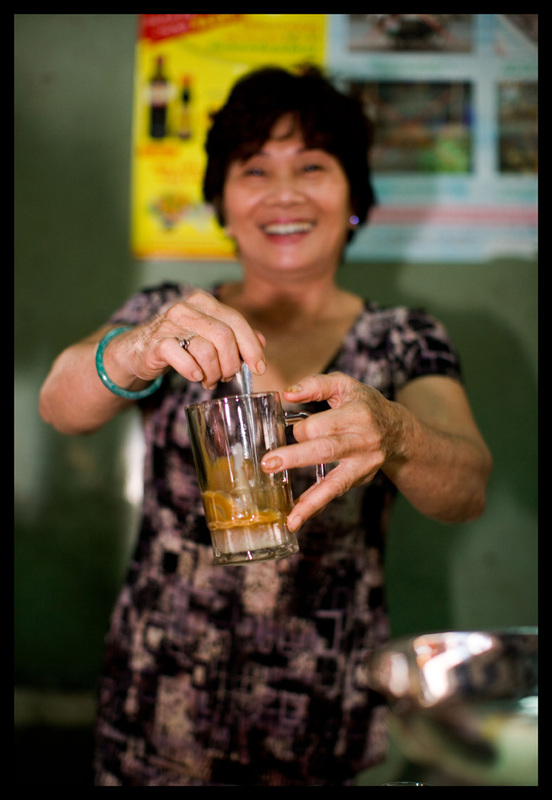 Cafe sua da, anywhere in Vietnam, 24 hours a day. I remember the first time I had Vietnamese coffee, after being a standard drip addict. It was such a huge, caffeine-and-sugar induced punch. I was wired...and hooked. I agree, the no-stir method is the best way to enjoy it. But THREE in one day!?! I think I'd have a heart attack. Bayi -the Vietnamese version holds up to ice better, staying thick and strong to the last drop. They use shots of coffee rather than a whole cup a la kopi peng. Nate - not three in one day. Three in one hour!!! We were buzzing, that's for sure. Ah, a post close to my heart. Coffee is something I struggle with: struggle because of my addiction to it, and because I am always looking for that perfect cup, with mixed results. It's like a lifelong quest rife with disappointment, and an occasional succees. 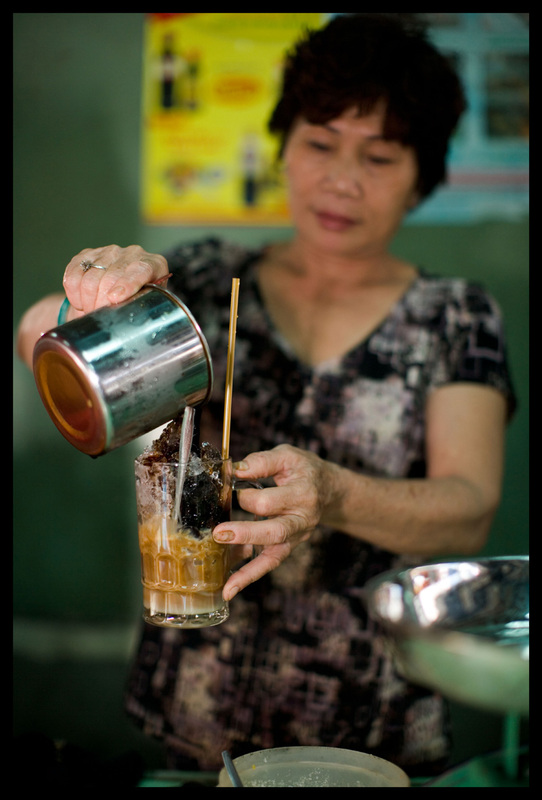 Thai street coffee, although at times good, is nothing compared to the sweet bliss that is vietnamese coffee. I have multiple makers, from all over the world, but time and again try and recreate what I have had in Vietnam. I actually made a rather successful stab at it again this very morning. But like you said, it never really is the same... sigh. 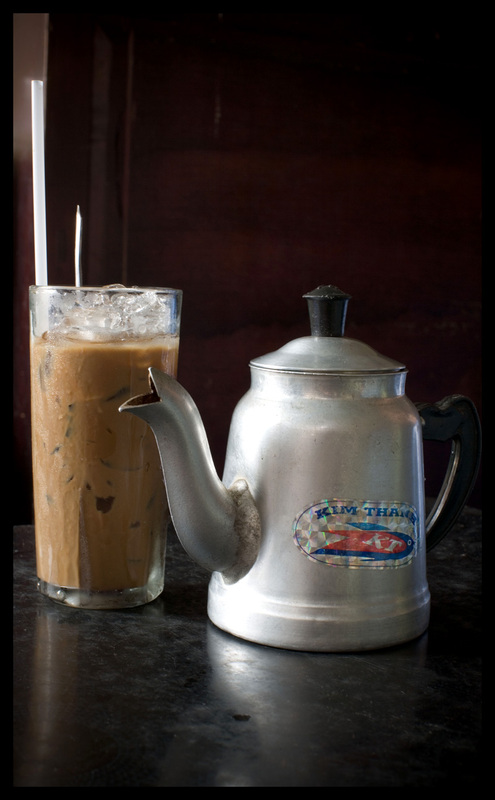 As a die-hard Malaysia-phile--that everything in Malaysia is the BEST!--I have to agree with you that Vietnamese coffee is top notch and better than Malaysian coffee, especially when it's served traditionally in that tin container / filter / drainer thingy...you know what I mean. Robyn - I'm a sucker for a coffee post. Great work! The coffee culture is different in the south - slightly thick and syrupy, lots more ice and much bigger serves. In Hanoi, it's a shorter drink, same components, still wickedly drinkable! I go whacky after two, though. You're my hero! :)) but keep doing it. i too am afraid of whats' in that coffee but i'm guessing there's a hint of chocolate grind. a - Alright, so what's your trick? Don't be coy. Do tell ... or at least post it on your blog. Bee - I rather prefer it not be served in the drippy thing. Watching it drip/waiting to drink is torture! I don't know ... we have had really great, thick kopi beng here. But the taste is not the same. Not as smooth, perhaps, as Vietnamese. Which is not to belittle a really great Malaysian kopi peng. It's just different, no substitute. Ann- tastes even better than it looks! Sticky - I guess I shoud have labeled this post 'pandering to Sticky'. You always comment on our coffee posts! eastingfeasting - chocolate? Perhaps. I've heard some beans are roasted in butter? Who knows, really? Don't want to! I thought the thai's were justifiably famous for their iced coffee? did the copy the viet or vice versa? Radman - you're right, Thai iced coffee can be great, but it is getting harder and harder to find the real thing (ie. not Nescafe), on the streets of Bangkok, at least. Also, Thai coffee - like Malaysian - good as it is, just doesn't stand up to ice the way Vietnamese does. I think neither country copied the other. Coffee has been grown in Thailand for years, and Vietnamese have been drinking coffee at least as far back as French colonization. cafe sua da - you're clearly more of a coffee expert than I. I had no idea softness or hardness of water had anything to do with it (but that might explain why the coffee we have shipped over from the US just never ever tastes the same here in Malaysia as it does there). RE: bringing the water to a second boil? Why is this? I suspect it could be the elements in Vietnam soil where the coffee plants are grown... just like Vietnam black pepper. My opinion, I think VN black pepper is hotter and "tastier" (stronger smell) than the ones Ive had in the US. I believe the French brought the coffee culture to Vietnam, VN is more like a tea country than a coffee one due to China's influence. Robyn, did you use Trung Nguyen's weasel coffee for cafe sua da? It's delish and gives you heart palpitations. The beans do matter and you want a dark roast; grind it super duper fine to extract an inky liquid. I grew up with one of those Italian double decker Italian coffee makers. Now, we use a small machine. Water, yes -- filtered is best. The condensed milk matters too, and usually, the stuff made with cream and no weirdo additives makes for better results. In the U.S. overseas Vietnamese swear by yellow cans of New Orleans Cafe du Monde, which has chicory to smooth out the rough edges. I just choose a dark roast. Maybe I'm biased, but I've never gotten used to drinking other Southeast Asian style coffee drinks made with simple syrup and canned evaporated milk. The Vietnamese version rocks. Viet - I suspect you're right. Terroir must figure into the unique flavor of Vietnamese coffee, as it does coffee grown anywhere (and I agree with you about Vietnamese black pepper - we planned our trip back to Saigon just as our stash was running out ... and stocked up on a kilo of black pepper while we were there). Interesting theory about the dripper ... though I think of Saigon as anything but slow-paced! Andrea - yes, you're biased. ;-) We did try TN's most expensive blend. Dunno. Perhaps having the real thing right outside our door made me less likely to work at getting it right at home. Do you make Viet-style coffee at home now, with a regular machine? Cafe du Monde - I had forgotten about that. We first stumbled upon that in a Viet grocery store when we lived in Boston long ago, and used it with the Vietnamese drippers we bought there. Got a good result. Thanks for reminding me. 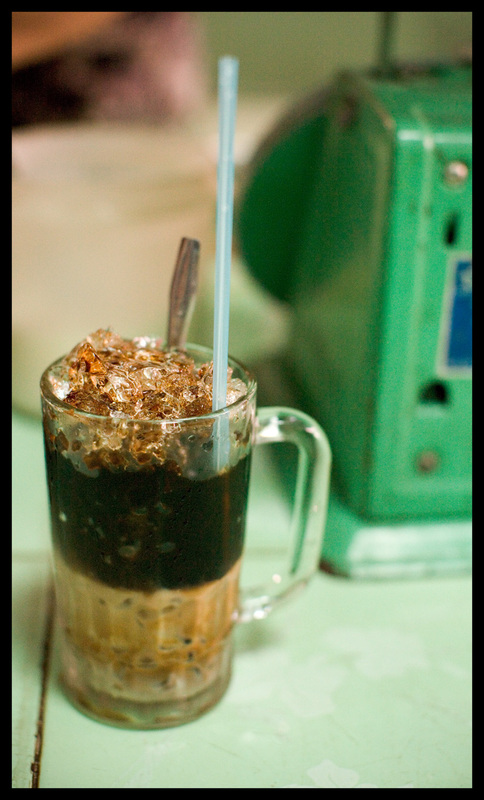 Malaysian iced coffee is darn tasty but, yeah, I have to agree with you - Vietnamese iced coffee is number 1 in SE Asia. IMO. Ugh. Vietnamese coffee. It's the root of why Fair Trade even exists today. I like the way you present her making coffee. This is just Ho Chi Minh's coffee. It's not strong enough. It's far different from Buon Ma Thuot's coffee - the true coffee style in VN.